ReDeads are a Zelda fan’s childhood nightmare. Most times, when we’re forced to face these terrifying zombie-like creatures, it’s hack and slash and then get the hell out of there. But haven’t you ever wondered what exactly a ReDead is? Are they the corpses of unfortunate Hylians, or are they something more sinister, born of dark magic? YouTube user and Zelda theorist ZeldaConqueror is certain that he has the answer. Make the jump to check out his video and see what he has to say! In this video, ZeldaConqueror brings up several pieces of key evidence- mostly from Ocarina of Time– that supports the idea that ReDeads were initially human. However, as ZeldaConqueror points out at the beginning of his video, the origin is still a little iffy due to Nintendo changing their definition between Zelda games and the Smash Bros. series. At this point, I think it all depends on interpretation, just like any supernatural being. We as humans have so many ways of explaining something that doesn’t make sense and the lore becomes a jumbled mess. It could also have been that throughout the different dimensions in the Zelda universe, ReDeads are explained in so many different ways that the origin also got lost in translation. What do you guys think? 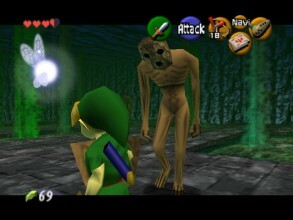 Have you always considered that ReDeads were once human, or that they were like other monsters found in the Zelda series and created by dark and sinister forces? Do you have your own theory? Let us know your thoughts in the comments below. Also, feel free to check out more of ZeldaConqueror’s Zelda theories here on his YouTube channel. Some of his videos include discussions on temples, the aliens in Majora’s Mask, and even the family cursed by skulltulas in Ocarina of Time.